China has some of the oldest and most intriguing traditions and cultures on the planet. Yunnan is no exception - Hidden regions, cultural secrets and more await in this Yunnan Discovery bike tour. Yunnan is located in the southern part of China, sharing the same border with Thailand, Laos, and Vietnam. This location is noted for its fascinating history, vibrant capital city, beautiful landscapes, breathtaking scenery, unbeaten trails, historical influences, ancient architecture and monuments, a diversified culture, and ethnic tribes with their colorful costumes and the sensation of serenity that engulfs the senses of every single visitor that sets foot in this part of China. 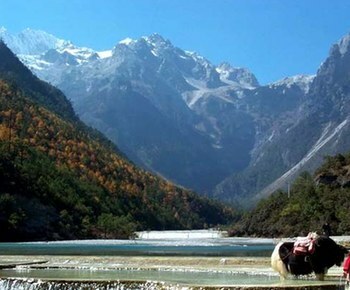 Discover the Yunnan historical cities of Lijiang and Dali. The spectacular landscapes that surround these cities are in a class of their own. The old towns found inside the cities, like the Ancient Dayan Town in Lijiang and the Dali Old City, will take you back in time. The old houses, ancient buildings, and cobbled streets create intrigue as you realize how people once lived in those olden days. It is hard to believe that the people who live in Yunnan now still live exactly the way they lived thousands and thousands of years ago a simple life, undisrupted by the troubles of the outside world. Kunming, the capital city of Yunnan on the other hand, is a vibrant and growing city, with the all technologies and architecture of a modern city. Don't let the modernity of the city fool you, as within the city, there are also historical buildings and cultural influences that makes this capital city special in its very own way. The Shi Lin stone forests will leave you in complete awe. There are some tough climbs in high altitudes with fast descents. Riders should have a moderate level of cycling experience for this tour. Riders should also be in at least moderate physical condition because of the altitudes involved with the tour. The tour is supported by a mini-van 100% of the journey to provide elected transfers if a cyclist desires it. There is a real mixture and variety of riding on this tour. Some days are short but have hill climbs, and others are longer, flat and fast. They are all filled with jaw-dropping scenery and enough culture to fill even the most culturally starved traveler. Day 1: Meet and greet in Kunming. Fit bikes and short city tour. Day 2: Ride to Lijiang. Ride around Lashi Lake and visit Zhi Yun Temple. Day 3: Ride backroads to Bai Shui He. Day 4: Ride to Hutiao Xia (Tiger Leaping Gorge) and Yangzi River. Day 5: Free day to explore Tiger Leaping Gorge. Day 6: Ride out of Tiger Leaping Gorge to Bai Shui Tai. Day 7: Scenic ride to Zhongdian (Shangri-La). Day 8: Short ride to visit Ganden Sumsanling Monastery. Day 9: Ride to Stone Drum town and lesser Zhongdian. Day 10: Ride to Shaxi Village. Day 11: Hill climb to Er Yuan Hot Springs. Day 12: Ride to historical Dali. Day 13: Transfer back to Kunming. Day 14: Breakfast and then onward travels. - Number of cycling days: 9 full days of cycling, 1 half day. - Accommodations: a variety of accommodations are utilized from guesthouses to 3-star hotels.